I bought John Fuller's The Ghost of Flight 401 at a book sale recently. The copy looked and smelled wonderfully old, and that combined with the word 'ghost' in the title is what made me buy it. It was only after I came home with my bag full of books, read the back cover and looked it up on the internet, that I discovered that it is supposed to be a non-fiction ghost story. Wow. I was hooked. A week-long vacation and my unfortunate choice of the travel read (Pasternak's Dr. Zhivago) interrupted my reading of this fascinating book, but as soon as I came back, just yesterday, in fact, I immersed myself into the book once again. Summary: In the dead of night in December, 1972, Eastern Airlines jumbo jet flight 401 plunged into the Florida Everglades killing 101 passengers and crew. Months later, the ghosts of its pilot and flight engineer began to appear on sister ships carrying parts salvaged from the crash. Ace investigative reporter John Fuller heard rumors of the ghosts and swore he would uncover the true story, no matter how bizarre. At first, airline employee, fearful of retribution, refused to talk. 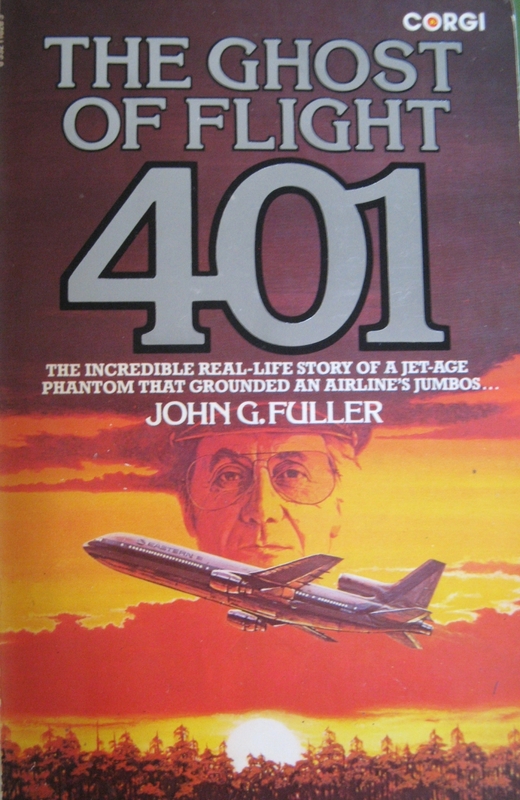 But Fuller persisted and finally, one after another, stewardesses, pilots, and ground crews came forth to tell one of the most astonishing stories in recent aviation history. This is their tale--a hair-raising jet-age ghost story that can no longer be denied! My thoughts: I never thought I would actually like a book where the author is convinced that the ghosts do exist and has written the book in the form of a non-fiction. I was certain I'd find it ludicrous. I was surprised right at the very beginning, when I actually liked the way the author wrote about his experience with the planchet. The author tries repeatedly to convince the reader that this ghost story is not just a story and that even though it sounds entirely crazy, it's not. That being said, this is not really a horror story. It's more like a detailed study of a horror story. There are scenes when you're absolutely scared, but there are also parts where you are absolutely bored by the author's repetitiveness. I thought the premise of the book was fascinating. Though it may be best to keep in mind that this makes a good read for someone who dives in not expecting a scary tale. The book does have a good flow, even if at times there are too many unnecessary details. The writer could have withheld some of his extensive research to avoid information dumps. A thing I loved was how writer-ly his obsession with the new story sounded, the way he conducted his research, just travelling and talking to people and it was the most romantic concept. I'm sure it's not quite as pleasant being a writer but he made it sound amazing. Of course, people have said that Fuller tweaked a lot of the facts and made up almost half of what he's written. People have said that there is no way they could believe what he's written, because half the details aren't even true. Considering the fact that I wouldn't believe what he's written even if he stuck to the entire factual truth, I'm not really bothered by the inconsistencies in the facts. That makes the book neither a history lesson nor an entirely made-up horror story. Call it the author's point of view on what must have happened or just a made-up non-fiction, if there is such a thing as that. Either way, I liked the book and am glad I bought it. And that's my last read for the R.I.P. Challenge. Before I forget, Happy Halloween! Summary: An aeon ago it crashed into the frozen earth. Millennia later it was removed from the icy soil, still functioning. They opened it... they shouldn’t have. Alex Hunter - in the mission that turned him from a normal man into the weapon known as the Arcadian - and the elite team of soldiers known as the Hotzone All-Forces Warfare Commandos must enter a hostile country to rescue a defected Chechen researcher from the center of a country at war. But the HAWCs are not the only ones looking for the rogue scientist and the mysterious package he carries with him. A brutal and relentless killer and his death squad are on the trail too - and they bring a savagery with them that Hunter and his team have never witnessed before in modern warfare. The HAWC team must race the clock to rescue the scientist, prevent the package from falling into the wrong hands … and save the world from a horror that should never have been woken. My thoughts: I had not read any of the author's books before reading this one, so I was kind of worried about plunging into this new world that I didn't know anything about. 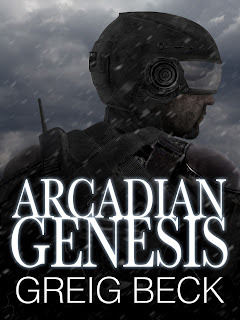 But that shouldn't be a problem, because this book is a prequel to the rest of his books and so it explains pretty much everything anyway, and serves as a great introduction to the author. It was a novella and though not perfect, it was quite good. There were a lot of things I liked about the book: The pace of the book is fast and I was involved in it entirely right from the first page. It is a short book and a lot happens very quickly, which is what makes it the kind of book that should be read in one sitting and with minimum distractions, like I did. The story is a great combination of mystery and action. I am normally not the biggest fan of thrillers, but this one is gory and chilling to the core. The character development is pretty great for a book this size and the world created is one of a kind. The thing I didn't like the most was that the book is very short, and for people who aren't already acquainted with the author, it isn't quite enough. For the author's fans, a prequel must be a unique treat! But for me, it was more of an introduction or a prologue than a complete story in itself. As a standalone, the book is a considerably okay read, the kind that I would read while travelling, or in waiting rooms, to while away time. And still, I loved the author's writing style, the theme, the idea of such a world and such a lead character. I guess the reason I enjoyed the book so much is that it seems like a promising series and I would certainly love to read the other books. I can't say for sure if everyone would like this book, but I would definitely recommend thriller, mystery and action genre lovers to try this author! If you like the sound of this book, go ahead and grab your copy from right here. I received this book from the author in exchange for an honest review. 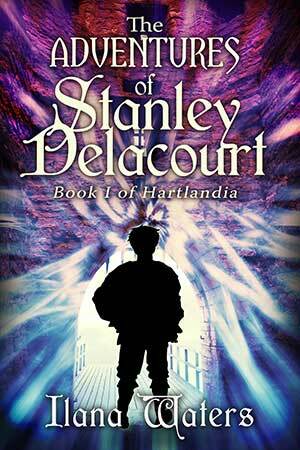 The Adventures of Stanley Delacourt is a middle grade fantasy novel written by Ilana Waters. Summary: Ten-year-old Stanley Delacourt loves his quiet life in the peaceful village of Meadowwood. At least, he does until his best friend is killed. Then the town library—where Stanley lives and works—is burned to the ground. The individuals responsible for both tragedies are a nasty group of soldiers. They work for the kingdom's new leader, Christopher Siren. With the grown-ups too fearful to take action, Stanley vows to confront Siren. He plans to get answers and demand justice. Little does he know that his journey will involve sword-wielding knights, kidnapper fairies, and dark magic. Stanley has only two allies back home: a witch named Meredith, and a young apothecary called Sophie. Can they help him discover the reason behind Siren's crimes and end this terrible reign? Or is Stanley set to become the next victim in the tyrant's evil plot? My thoughts: I used to look at books like Artemis Fowl and you know, Percy Jackson and imagine how much I would have loved reading them in my ‘middle grade’ years. I relived those years, so to say, when I read almost all of Diana Wynne Jones's books in a week. This is another of the books that I am sure I would have loved a whole bunch of years ago. Now, it took me a little time to get past the way it was written. It sounded childish, which I know was intentional, but it was something I am not used to reading. Being a child at heart (the kind who still enjoys reading Enid Blyton's short stories), though, it didn't take long for me to be hooked on the book. The author has created a world with intricate detail and what was surely a lot of research, but what I like the most is that she has managed to avoid the one thing that spoils fantasy series more than anything else: information overload. We get to know just enough at just the right time to enjoy the book, while still being curious enough about the new world to read the sequel. The characters are kind of typical in place, but I like the contrasts in the characters. I especially like all the female characters in the books. The word that describes the writing style best is: fun! I could tell the author enjoyed herself thoroughly writing the book, with its poetic flow and the actual comical poetry written in it. It was an honest effort and the style as well as the magic in the book kept reminding me over and over of Diana Wynne Jones's books. I was almost entirely sure the writer had used her as an inspiration. It wasn't the perfect book I've read: I mean, there were thing clearly inspired, arguably borrowed from other books, it wasn't the most original or unique and it wasn't written quite as impeccably as I would have liked, but it is a great book nonetheless. For those of you, who are used to reading middle grade novels (i.e. if you are actually that age or you've never quite grown up in your head, like me) this would be quite an enjoyable book and I would certainly recommend you to try it. Grab your copy right here! To know more about the author, check out this nice little interview. Today you get to know the author of a middle grade fantasy novel The Adventures of Stanley Delacourt, which is a promising start to the Hartlandia series. Here's an interesting interview with Ilana Waters. 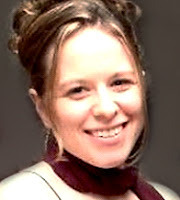 A little about the author: Ilana Waters is a freelance writer who lives in New Jersey. When not creating content for websites, she can be found working on novels and short stories—as well as nibbling string cheese. She once pet-sat an electric eel, and enjoys walking in circles around the park for no particular reason. Ilana is currently writing Book II of the Hartlandia trilogy, due out in 2013. Thank you so much for this interview, Ilana. The title of the book says “Book 1 of Hartlandia.” Could you tell the readers a little about your world? How much research went into creating it? World-building is such a funny thing in fantasy literature. Everyone agrees that it’s a crucial element of the story, but almost no one can agree on how it should be done. My basic recipe for the world of Hartlandia was to take everything I loved about traditional, medieval, Tolkien-style settings and put them in a novel. Naturally, I didn’t want to copy anyone else’s world, but construct one with my own “flavor” and personality. I literally wrote a list of everything I wanted in “my” world. Castles. Cottages. Magic forests that appear out of nowhere. Then I considered what I didn’t want (graphic violence—certainly present in medieval times, but inappropriate for a children’s novel. It also makes me queasy). I did a fair amount of research on the time period, the tools used, and the way people might have acted. But since I wanted the story to resonate with 21st century readers, not all of that made it into the final draft. This took a lot of rewriting and cutting things out so I didn’t “info dump” on the reader. And I realized, sadly, that I wouldn’t be able to include everything I wanted. Pirates. Galleon ships. Epic battles between armies. But that’s okay—it leaves a few things for Book II and III! And to add my own flavor, I made the world a mishmash. It’s what I call “mostly medieval.” But there are many elements that wouldn’t have existed during that time. Things like libraries, female apothecaries, public schools, and factories. And Double Fudge Mocha Latte Very Very Cherry Chunk ice cream. It didn’t exist back then. But it should have. My favorite thing about writing fiction is going to sound pretty simple: you can do whatever you want. I especially like the fantasy genre, because you’re not constrained by reality (as you are in contemporary fiction). Don’t get me wrong—I like contemporary fiction too. But haven’t you always wanted to live in a world where you could meet fairies, make up spells, and own a magic sword? I know I do! And yes, I write a lot of things besides novels. Right now I’m working on two novellas—the first I hope to publish in the beginning of the year. That one also takes place in Hartlandia, but centuries earlier. You get to meet one of the character’s ancestors and go on an adventure with him. I’ve been experimenting with flash fiction as well—it’s so much fun! I can’t believe I never tried it before. I think everyone should. And poetry, oh yes! There are a few poems in The Adventures of Stanley Delacourt which turn out to be more than “just” poems. But of course, your readers will just have to explore the book to find out more! and try to serve every need? for bread that is rotting? Are you a reader, too? If you had to pick between reading and writing, which would you choose? Okay, easy one, your writing keeps reminding me of Diana Wynne Jones. Were there any particular authors or books that influenced your writing? Of course I am a reader! I don’t think I know a writer who isn’t. And to pick between reading and writing would be an impossible task. Each informs and inspires the other, so they’re pretty much fused together. And thank you for saying my writing reminded you of Diana Wynne Jones. She is one of my favorite authors (I even did a blog post on her), whose style I do try to emulate. She was a definite influence. And I mentioned Tolkien earlier, of course. I think Philip Pullman’s world-building is something I aspire to as well. Thank you again, Priya, for having me on your lovely blog! Doesn't the book sound like fun? Check out the review tomorrow and until then you can visit the author's website right here! I wanted to buy a non-fiction book on Mary Celeste (I don't remember its name) when I came across this one. If there is one thing I have always been scared of, it's water and oceans and sea life and such and the premise of this book, a lost expedition, seemed fascinating. It was snowing during the burial. The wind was blowing hard, as it always does here on this godforsaken Arctic Waste. Just north of the burial site rose Sheer Black Cliffs, as inaccessible as the Mountains of the Moon. The lanterns lit on Erebus and Terror were only the dimmest of glows through the blowing snow. Occasionally a fragment of Cold Moon would appear from between quickly moving clouds, but even this thin, pale moonlight was quickly lost in the snow and dark. Dear God, this is truly a Stygian bleakness. 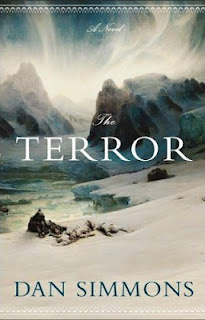 Summary: The Terror by Dan Simmons is a fictionalized account of Captain Sir John Franklin's Expedition to the Arctic to find the Northwest Passage. As the two ships, Erebus and Terror are stuck in the ice, the crew is stalked by a monster, that is killing them off one by one. Almost all the characters in the book are based on actual members of the expedition, including Franklin, captain of Erebus, Captain Crozier, captain of Terror, Fitzjames and Dr. Goodsir. My thoughts: This was supposed to be my first read for the R.I.P Challenge. I have to admit, it took me much longer than I had expected to finish reading this book. There were times when I felt absolutely bored, but trudged on, determined to complete the book, and I am very glad I did. The book is massive, but entirely worth it. If I'd written a review halfway through the book: I would have said that I didn't like the book, which is why this review is going to seem haphazard. I don't know what else to say, but, all the boring details in the first half of the book are thoroughly redeemed by the immense excitement in the last few hundred pages. Very few authors can master as many different voices as Simmons has in one book! I especially liked Crozier's point of view and sometimes, Dr. Goodsir's. The shifts in the points of view and time took some getting used to, but the book was so long that I did have enough time to get fully accustomed to the writing style. The characters are really wonderful and so is their desperation, you almost experience the dreary atmosphere in the air. The book is tastefully gruesome, if there is such a thing as that, and the writer knows exactly how to shock, scare and amuse you. Crozier enjoys his walk in spite of the creeping cold that has made his face, fingers, legs, and feet feel like they are on fire. He knows that this is preferable to them being numb. And he enjoys the walk in spite of the fact that between the slow moanings and sudden shrieks of the ice moving under and around him in the dark and the constant moan of the wind, he is certain that he is being stalked. I'm going to end this clumsy review-rant by saying that, if not anything else, this book is definitely unlike anything I have read before. It is a haunting mixture of the eerie feelings that history and fate bring on, freaky descriptions of ice and being lost at sea, not to mention, we do get a glimpse of Eskimo mythology, again very tastefully managed. Even without the haunted mansions, pale white ghosts or vampires and zombies, it still does scare. So if you have some time on your hands and seem to like horror fiction, spend this Halloween experiencing The Terror! I've been feeling like a complete moron for the past two weeks, blog-wise. I have exams and work and people coming over and no time to type any of the reviews I'm supposed to finish writing today and I haven't read anything in over two weeks. I signed up for Dewey's Read-a-thon, but wasn't able to take part in it, I haven't read anything for the R.I.P Challenge in a while and in a week, I'm going to be away for another two weeks. But that's not what I need help for. Today, I woke up to find my blog stats changed to 7 all time page views, I have no idea why. Has this ever happened to any of you? Have you ever lost two years of blog stats, because if you have, I would really like to know how to solve that! By the way, I created a new writing blog and signed up for NaNoWriMo. Let's see how that works out. Free Verse or Formal Verse? In my last post, I asked you to tell me about your favourite poems. Recently I've been going through a lot of "calls for submission" as a part of some work! I noticed many publishers mention that they only accept free verse or modern style and that do not accept poetry 'with rhyming lines', as if it were a terrible thing. I have read a lot of poems in the last few months, partly because I had to learn them, partly because through all the studying (hah) I actually developed a genuine interest. From whatever poetry I have read, I think formal verse is just as effective a way to put across a message. Look around you, everything in the nature has structure; that should be enough to prove that structure has beauty too. The metric patterns, for me, give a sense of precision and balance to the poem. I don't think that formal verse with things such as metre or rhyme limits your creativity, I actually think it challenges you further. The rules were there for a reason. While it is okay to break them when they seem like a cage around that particular poem, breaking the rules is neither the better way nor the only way to expression. I may be wrong, but every time someone says "poetry is freedom" and "poetry is expression, which is not bound by any laws", I can't help but think of all the greatest masters of poetry, right from the Bard, who used the rules and patterns and laws to express, and express a lot. A bias towards neither of the two types of poetry, formal or free verse: that's what they mean by freedom. In my three posts on poetry on this blog, I have made it a point to bash the poems found all over the internet, those which are generally assisted by glittery, romantic or dark, mushy, pictures of suicidal people. And, I do not like them: random difficult sounding words picked right out of a thesaurus, stringed together, deliberately avoiding any semblance of grammar do not automatically qualify as poetry. But, as I was writing that right now for the third time, I realized for the second time how incredibly judgmental I was sounding and so I decided to actually tell you about one poetry blog that I regularly read and actually sort of love. Do visit! I'm sure there are a lot of great poetry blogs on the internet and I hope I discover more of them. I've recently began enjoying the historical fiction genre and I decided this week's Top Ten Tuesday (Rewind!) to list them. I'm not sure how long this list is going to be, hence the title is favourite historical fiction books rather than top ten. Historical fiction, as I understand it anyway, is a fictionalized account of something that actually happened in history (like a retelling) or a novel with a historically accurate setting but fictional characters or a book which presents an alternate history. I may be wrong, but this is what this list includes, books which I loved for that fascinating, at time eerie feeling I had a thought, that even some of this might have actually happened. I have never been good at remembering dates, so whatever I do know of the world history, it's through reading fiction. - The Crucible by Arthur Miller: This was the first full-length play I read and I enjoyed it immensely. I was looking for a book that best described the Salem Witch Trials and this drama does it. It has been argued (a lot) whether this play is historically accurate, though the characters are based on the real people, who were in the town of Salem when it all went down and the atmosphere of hysteria is portrayed most convincingly. For me, it gives a basic idea about the witch trials, not to mention tells a whole lot more about Miller's views on McCarthyism. Not to go too much into the details, let me just say, this is definitely a fascinating piece of fiction. - 11/22/63 by Stephen King: Could I just say, I loved this book? This is the story of the man who goes back in time to prevent JFK's assassination in '63 and instead finds a home for himself in the past. I loved the characters and the he has made the time travel seem so believable. I recently found out that King had the idea for this book a while before he published his first novel, Carrie, and has now released it almost forty years later. Isn't that kind of amazing? - The Werewolf of Paris by Guy Endore: I read this last month (or this month not sure) but if you scroll down just a bit you'll find a long review! This book is about, as you can tell by the title, a werewolf in Paris. The story is set in France, where the War of 1870 and the fall of the Paris Commune form the perfect backdrop for a gruesome tale of a boy, who cannot control his inner monster. - Jonathan Strange and Mr. Norrell by Susanna Clarke: This book is just something else. It is an alternate history of the 19th Century England during the Napoleonic Wars, based on the premise that magic once existed. And, in this tale, the two eponymous magicians bring magic to back to England. The author has created a wonderful sense of the past and the English and even the war with her precise imagery. I loved the parts when the Jonathan Strange, probably my favourite fictional character, invented tricks to win the war or to confuse the enemy like magically creating roads and moving entire towns, thus rendering any maps useless. And how can you miss the fact that he helped defeat Napoleon at the Battle of Waterloo? Honourable mentions: Slaughterhouse Five by Kurt Vonnegut, The Book Thief by Markus Zusak, The Children's Book by A. S. Byatt, Perfume by Patrick Sueskind and This Thing of Darkness by Harry Thompson. I might have missed some, but I do love all these and I also do welcome recommendations! Why I don't write "bad reviews"! # 1 - The oh-so-sarcastic reviews I mentioned, with things like "Only dumb people will like this book. ", "The book made me want to puke." or the more irritating one, "It's for chicks." contain this absurd assumption that the reviewer is the definition of smart and that there is no such thing as personal preferences. # 2 - There is no such thing for me, as a completely horrible book. Even the most boring books I have read had something about them that I appreciated. I am being honest and not unduly fair, when my negative reviews (the rare one or two star ones - by the way, I don't like giving these star ratings, but that will be the topic of another rant.) contain four lines of what I liked. # 3 - The most important reason, I think, is because I just don't like to waste some fourteen minutes of my time, not to mention, my precious humour, describing something that I didn't even like in the first place: more so when I know that there is someone out there just waiting to pounce on me and disagree, someone I'll never be able to convince otherwise. Why go through all the trouble, when I can spend that very time doing something I actually like? 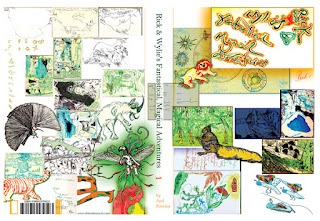 Today I have an interview with writer Andi Katsina, author of Rick and Wylie's Fantastical, Magical Adventures; I will post the review within the next few days. But right now, what you have to do is check out this fabulous interview - just three questions, which tell you a lot about the author and give a pretty accurate idea about the awesomeness of the book. 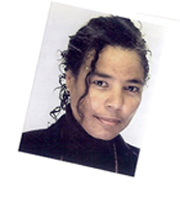 I'm English, of rich Irish, African descent. Born in the sound of bow bells, an orphan, I grew up in Manchester, England. Quite a bit more than forty, I‘m a vegan, though occasionally lapse into vegetarianism. Throughout my school years I was a champion athlete and swimmer, going on to become an athletics coach, swimming teacher and youth leader. After which time I was trained as a Chartered Accountant. Interrupting my training, I branched out, working freelance as a troubleshooter in the field of accountancy. Six years of adding and subtracting, was followed by two years of trading as an international commodities broker. This led me to the sedentary position of ‘trader in antique, oriental carpets’. It was at this juncture that I became completely inspired to become a writer. As a ‘school kid’ I very much enjoyed writing plays in English, Latin and French. Fortunately for me, writing came naturally. I so, so like writing stories that give people, especially young people, and people young at heart, the chance to exercise their own imagination. I love taking my readers on fantastic journeys. The enjoyment and taste of adventure my stories give to my readers, warms me greatly. 1. There are so many books out there that promise a wonderful ride into a new world. What makes the world in your book unique? How would you convince people to read your book? What makes the world in my book unique? My fantasy world was created by unbridled imagination, driven by love, determination and endurance. My fantasy world is real! You can feel it, visit it, travel around in it, touch it with your mind. Priya, you've read my book, so I’m sure you can identify with this! You can meet my characters, take a journey with them. It’s a world into which you can happily retreat. It’s also a world that allows you to unleash your own imagination, a place where you can choose to journey either in complete safety, or at the mercy of your own exploratory desires. Some of the people and creatures within my world, if you so wish, can be your protectors. As magnificent a fantasy kingdom this world is, and I describe it to you in full colour detail over the course of three books, there are also dark areas, wicked creatures and nasty people, spawned from evil, areas from which my readers are normally protected, but areas that the great, great fantasy epics must provide. I don’t necessarily promise a wonderful ride; I ride motorbikes and sometimes you can fall off, or they can break down. But I do assure you, my dear reader, a long lasting experience and unforgettable great journey. Why should you buy my book? I love the fact that the more my book becomes known, the more people want to read it. Right now it’s on target to becoming a bestseller, my first bestseller : ) And it’s already being translated in Japan. One of the most rewarding aspects of being a writer is to see your readers grow in number. Still though, I just can’t bring myself to urge you to buy my book. Instead I would ask that you get to know me, get to know my work, talk to people who have read the book, and through this I’m sure you’ll feel that you really want to read my book too: Rick & Wylie’s Fantastical, Magical Adventures book 1 [Journey to the kingdom]. I care about my readers, and always appreciate your feedback. 2. They say you should never ask a horror novelist if he believes in ghosts. I’m going to take my chances and ask you if you believe in magic. Why did you choose to write fantasy? Why did I choose to write fantasy? Thanks for asking, Priya. All my life I've been surrounded by elements of fantasy. As a child I read books, the majority of them where made up fanciful stories. I sometimes watched television, the vast majority of the programmes; made up storylines greatly departing from reality. One of the major forms of entertainment in our societies consists of made up stories. Fantasy takes it a few steps further, for the most part leaving behind the seeming similarity to normal life, opening the door to mystical, magical, improbable situations. I've been blessed with an exceptionally active imagination, and an understanding of the value of fantasy in being able to offer people a retreat in which they can exercise their own imaginations. I love being able to create whole worlds in which we can be ourselves, but can also experience, explore or observe wondrous amazing activities, surrounded by people and creatures that are governed by none of the restrictions and limitations we are faced with. Other writers may agree with this, I hope, but I can say with all certainty that for me, having the wonderful ability to create the most fantastic, amazing worlds and universes that other people, my readers, can share, is such a beautiful feeling!! I truly hope you enjoy my stories…. 3. I sometimes write short stories, and I know many people who write poetry. How different/ difficult is writing a novel in comparison? What is your bottom-line advice to aspiring authors? Priya, this is an excellent question! As a writer you understand much of what’s involved in starting and finishing a written piece. In reference to the 1st part of your question, can I compare it to a track race? Writing poetry is comparable to the 200 metre sprint, a short story, the 400 metre dash, a book, more like the one mile race. But here’s the thing, to participate in any of these races requires training, discipline, and dedication, and all of these races produce champions. The only differences I can think of at this time is that the writing process continues a lot longer when writing a novel as opposed to poetry or short stories, and the written content is much more involved, complex, for the book. Short stories mirror the construction of a novel, but fewer words are used to tell the tale. Poetry in no way resembles short, or full length stories, as one does not need to rely on the context of the whole to convey the expression of a collection of ideas. The difficulty encountered in writing a novel, compared to a short story or poem, is that since the writing process lasts a lot longer, there is more time for the writer to encounter pitfalls before reaching the finish line; writers block, lack of material, weak storyline. There is a myriad of factors that can play a part in preventing one from finishing a novel, but this is exactly were dedication and discipline will protect the writer from failure, and ensure that the novel is completed. Another issue to be taken into full consideration; if you can write straight off the bat, excellent, otherwise always try and work out in your head, or on paper, voice recording etc, what it is you want to say. You need to know your subject matter. If it’s a poem of course you need to know what it is you want to express. If it’s a short story same thing, if it’s a book for heavens sake you need to know what the storyline is, I’m not saying you need to know it from start to finish, rarely is a writer so fortunate to know the whole story, details an’all, it depends how your thinking process operates in relation to the material you’re going to write about. In closing I give to you one of my own mottos, a sentiment shared by many, and a necessity you will become accustomed with if you do become a writer, NEVER GIVE UP! Also, rather importantly, don’t ever let the thought of not having any readers, or not being able to sell your books, short stories, poems, interfere with becoming a writer. As I’ve said before on many occasions, being a writer isn’t determined by selling your work, and it’s not determined by lack of readership. You find your way, you write your story, your poems, your prose, readers will come, they’re very generous and are always willing to give you a chance, you write, your readers will come. Good Luck, and always remember, never give up! Priya, this is for anyone who really does want to write a book but doesn’t know how to go about it, my post: How Do I Write A Book by Andi Katsina. Thanks for the great, really thought out responses, Andi. Wow, the last part has inspired me to just start writing, right now! Before I run off to do exactly that, check out the book's magical website right here! Summary (from here.) The Krishna Key follows Ravi Mohan Saini, a historian, who has been accused of the murder of his childhood friend Anil Varshney. To clear his name and save his future, Saini must look to the past and uncover the truth about a serial killer that believes himself to be Kalki, the final avatar of Krishna. Saini has to travel from ancient ruins to Vrindavan temples in an attempt to discover one of Krishna's treasures and stop his friend's murderer. 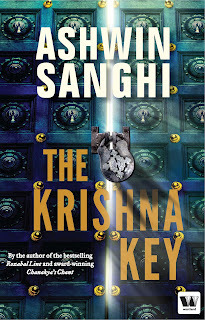 My Thoughts: If I didn't know better, I would have called Ashwin Sanghi's The Krishna Key a fan-fiction. He is supposedly known as the Indian Dan Brown and it is apparent throughout the novel whom he draws his inspiration from. I loved the way the story was interspersed with accounts from Lord Krishna's life, told by Lord Krishna. I've read reviews where people have said that they didn't understand what that had to do with the plot, but I think it is a nice parallel that the author has drawn. On the one hand, they are trying to prove, today, that Krishna actually existed, and on the other, we have the Lord himself narrating what "actually happened." It may not be what the author intended, but I could almost imagine the playful dark-skinned youth smirking as people ran around looking for his true story. That being said, had I ever thought about it, I would have imagined Krishna to have a more informal and fun writing style: I guess, it would have suited him more; but again, that's just me. Indian mythology (or as the book seems to suggest, history) is very vast, fascinating and for anyone who hasn't had to listen to stories of Krishna since they were two, it's also very exotic. This is definitely a book that would interest anyone who likes historical fiction and quick paced, action-packed thrillers.